5 September - Well, I seem to have lost a month as far as the ponds are concerned. While they haven't been completely ignored I'm afraid that since returning from our holiday I have found it difficult to get back into the 'usual' routines. Looking back at last year's diary I see that much the same happened then! Over the last week I have been gradually dealing with the excess plant growth in both ponds. One morning when I went outside I spotted this Water Scorpion swimming on the surface of the small pond. It is the first time I have seen one with wings extended - I can only assume it had just arrived. It was moving too quickly to photograph it there so I lifted it out in a dish to get this image. When I put it back it swam to a plant stem, crawled down under the water and folded its wings. I spent some time this afternoon removing some of the plants that are clogging up the water at the far end of the big pond. A lot of care was needed as there were numerous junvenile frogs and newts in the plants overhanging the edge of the pond. Also, when I have been removing plants complete with roots I have been surprised by the number of pea mussels that I have been finding, including lots of very small specimens, indicating successful breeding this year. This summer I have seen only the occasional dragonfly or damselfly. Today a single dragonfly passed over the garden but didn't come down to the ponds. The Fringed Water Lilies continue to flower every couple of days. The water mint plants have been flowering since we came home - I must take some pictures tomorrow. Last week I put a picture into the garden diary of a wasp at the water surface. Although this is a regular happening at the moment, but I am a bit puzzled by one bit of their behaviour. While the wasp I pictured was drinking, they often spend more time with the rear end of the abdomen in the water and its head up. 6 September - Here is one of the young frogs that I mentioned yesterday. 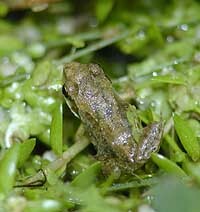 Barely 1cm long it is perched on vegetation at the end of the pond. 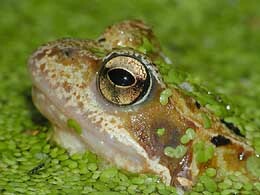 The adult frogs in and around the pond continue to indulge in periods of croaking when they are not out hunting. 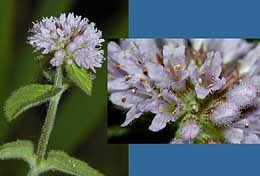 A picture of one of the Water Mint plants in flower. This is a plant that will spread in all directions when ignored. 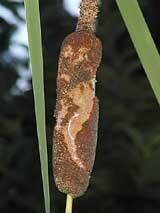 This year the heads of the Reedmace are looking a bit ragged after being nibbled by unseen creatures. 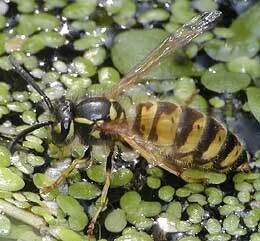 7 September - Two days ago I mentioned the behaviour of wasps coming to the pond. 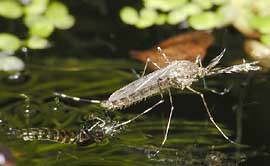 This picture shows one with its abdomen touching the water. It remained in this position for over a minute, with the rear end of the abdomen appearing to pulsate with muscular contractions. At no time did the wasp drink during this visit. 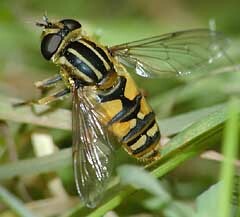 When the wasp does take off it is rather sluggish and often becomes a target for a pouncing frog. I don't recall ever seeing one caught. 8 September - Just a quick entry for today with this picture of a Culiseta annulata, one of the largest British mosquitoes, and one that I react badly to. In this case it is a male, so I'm in no danger of being bitten by it! 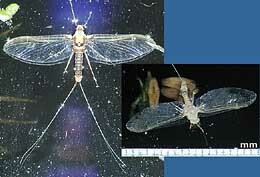 As well as its large size it has boldly banded legs. 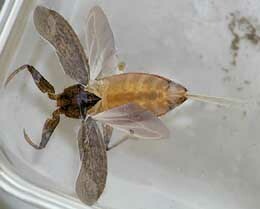 This one had recently emerged from its pupa, which is just visible under the water surface in the small pond. 12 September - Over the last few days I have continued to spend short times around the ponds, clearing 'old' vegetation, seeing numerous young frogs as I work. This afternoon, in bright sunshine I spotted this Mayfly dancing about on the dark green (and clean!) bonnet of my car (- perhaps it mistook it far water?). Moments later it flopped down onto the surface of the small pond - the left hand picture shows it moments later. It only has two wings, their reflection in the water giving the impression of a second pair. The right hand image was taken about 30 minutes later when I dropped a mm scale onto the water. You can see that the demise of the Mayfly has attracted the attention of a trio of flatworms, and has already lost one of its 'tails'. 14 September - Just a few glances at the pond today, but a couple of things caught my eye, including this hoverfly, a Helophilus pendulus (I think) that was tucked under plants at the side of the pond. 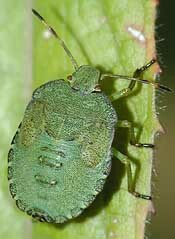 This juvenile shield bug (probably a Green Shield Bug - Palomena prasina) was on a Willowherb plant. I haven't taken a picture of one of our adult frogs for quite a time now, so here is a portrait taken this afternoon. The frogs are pretty active in the ponds and the flower beds now - there are plenty of flying insects about for them. 30 September - Another gap in the diary as things are quiet in the pond. Conditions are still encouraging plant growth and the continuing dry weather means that I have to top up the ponds quite regularly. 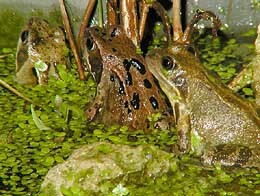 The frogs continue to provide the main action in both ponds. On 'watch' both day and night, they are at their most active in the dark. The favoured spots in each pond attract special interest with the occasional queue of frogs (like these three) waiting for something to venture over the pond edge.